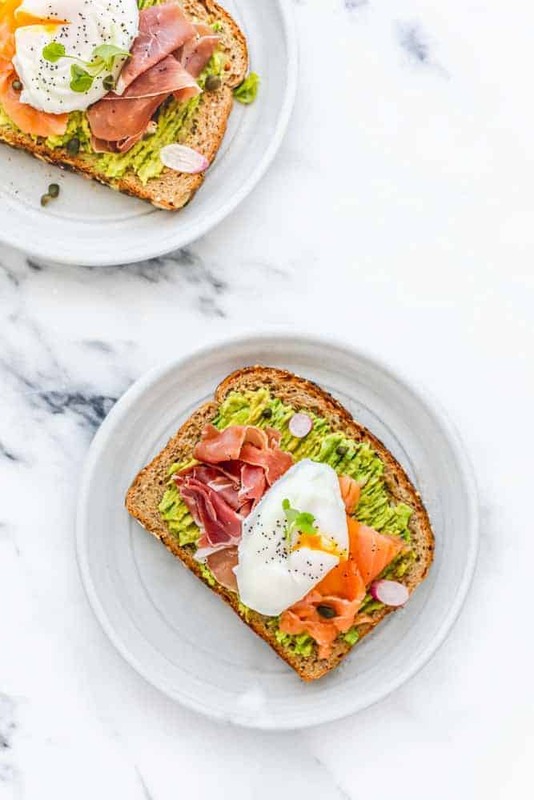 Today, I am going to share my favorite breakfast sandwich recipe, Smashed Avocado on Toast that is made with whole grains bread, smashed avocado with a pinch of cayenne and smoked paprika, layered with smoked salmon, prosciutto and egg. This open sandwich is filling and so easy to make yet has a scrumptious and original taste. It makes for a perfect breakfast sandwich or for snack that can be ready in less than 10 minutes. Every morning, I prepare breakfast and lunch for my family. Eating whole grains and high protein meal for breakfast is a great way to start off the day on the right foot. That’s why I always stock up on oats and whole grains breads in my pantry, and eggs in my fridge. 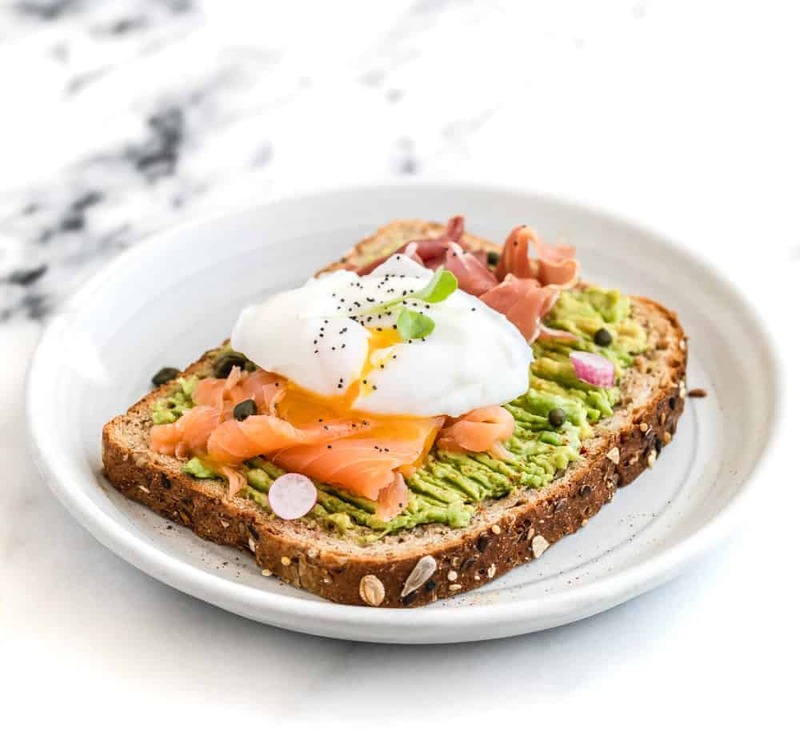 This Smashed Avocado on Toast is a great breakfast dish, or for snack time before a run or workout. It’s a comfort food with the perfect combination of healthy fats, carbohydrates, protein and fiber. A good amount of fiber and healthy fat can keep us energized until our next meal time. To make this open breakfast sandwich “Smashed Avocado on Toast”, I used a slice of Dave’s Killer Breads 21 Whole Grains and Seeds, which I purchased from my local Walmart. The bread stands out from the pack;, just like the name and packaging the taste of the bread rocks! I love that it has the right amount of course the seed-coated crust. Don’t just take my word for it, the people have spoken and Dave’s Kiler Bread is the best-selling organic bread brand in the country, I think a big part of that is that we as consumers are getting smarter and more demanding of higher standards. 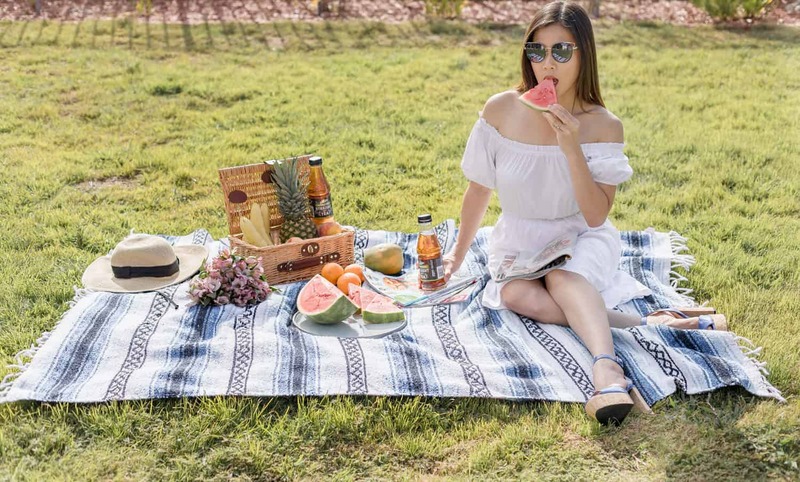 We don’t want artificial anything in our food, large amounts of protein and fiber, and more. Dave’s Killer Bread checks the box for each of these, making it a trusted brand amongst the healthy community. One thing I really like about this bread is how good it tastes on its own. My husband is trying to eat healthier carbs and replace chips with foods that have health benefits. Instead of chips and dip he tried out Dave’s Killer Bread and a hummus dip. The two paired so well, and he took in tons of protein, fiber and even Omega-3. From that to my recipe below, there are so many ways to make this bread a hit in the kitchen. Versatility: you’ve gotta love that in a food, especially a healthy one! 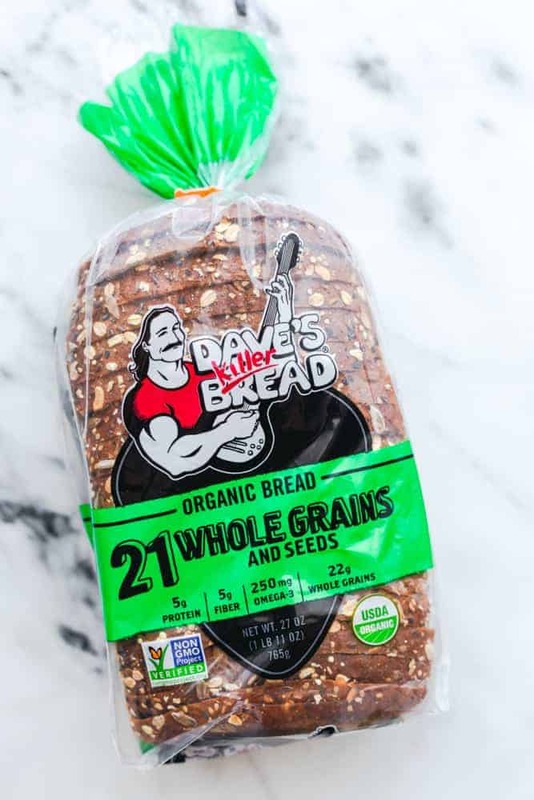 – Dave’s Killer Bread is USDA organic. – Contains 5g protein, 5g fiber, 250mg Omega-3, and 22g whole grains per slice. Looking forward to hearing what you think of my recipe and your experiences with Dave’s Liller Bread. 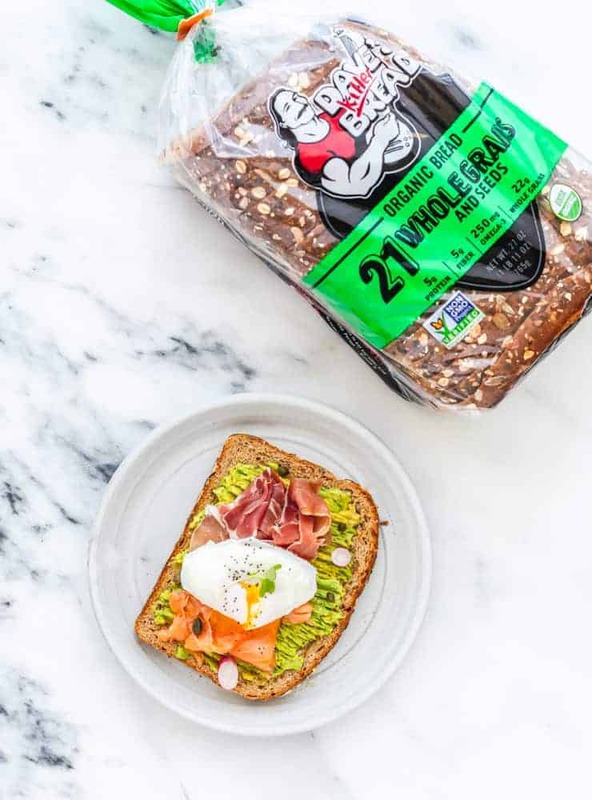 The perfect toast for breakfast, snack, pre or after workout. Toast a slice of bread on a toaster or skillet pan until crispy. Using the back of a spoon, roughly smash the avocado, until chunky but spreadable. Using the back of a spoon, spread the avocado mixture evenly onto each piece of toast. Place smoked salmon and prosciutto on a toast. Layer with cooked egg and sprinkle with some black sesame seeds or poppy seeds. Garnish with fresh micro greens and capers. This is the tastiest combo EVER!!!! Sign me UPPP! Thanks so much GiGi! xoxo!